The tea is in the fish which is attached by means of a chain to a kitten which holds its position on the rim of the cup. You get it? Of course, it's a tea infuser, you genius you! From Joie no less! Which means that the quality is guaranteed and the cuteness is ultra-cute. So, what are you waiting for, fill up the fish with some Earl Grey blends, release it into a little pool of warm water and wait for the tea to infuse until you get your twice daily fix of tea! Judge the amount of tea and the time for brewing with ease! 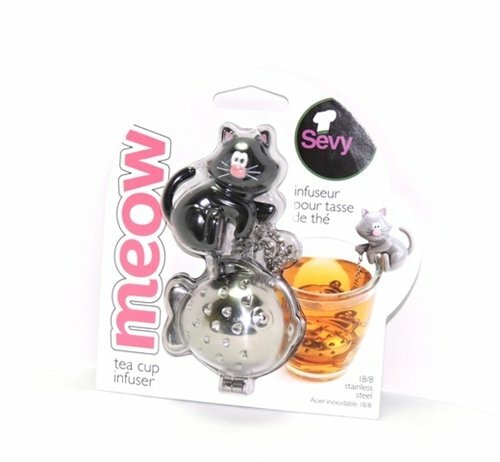 With this cat and fish tea infuser, we guarantee you an unending series of morning and afternoon tea that will leave one of the most refined tastes in the world in your mouth.